Формат : ТВ 24 мин. Перед своей казнью легендарный пират Золотой Король Роджер рассказал, что он спрятал сокровища One Piece где-то на Grand Line. Сейчас многие пираты ищют эти легендарные сокровища, чтобы заполучить звание Короля Пиратов. Один из этих пиратов, Monkey D. Luffy, это мальчик, который съел фрукт дьявола и получил неограниченные полномочия. Теперь он и его команда устремились на поиски One Piece, параллельно борются с врагами и приобретают новых друзей на этом пути. 061. Ending of Anger! Get over the Red Line! 066. A Serious Match! 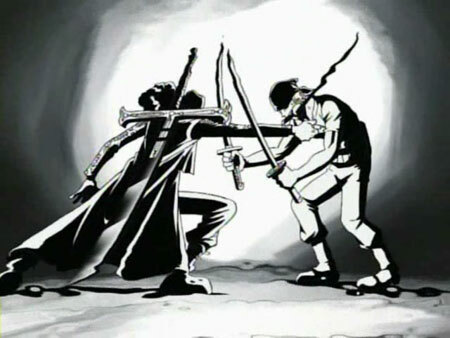 Luffy vs Zoro, the Mysterious Duel! 070. The Bird of Ancient Times! The Shadow Hiding in Little Garden! 077. Farewell, Island of Giants! Head for Alabasta! 080. An Island with No Doctors? Adventure in the Nameless Country! 081. Are You Happy? A Doctor Called a Witch! 083. Island where Snow Lives! Climb the Drum-Rocky! 091. Farewell, Drum Island! I'm Heading Out to Sea! 096. Erumalu the Green Town, and the Kung Fu Jugon! 099. The Pride of a Faker! Camus, Rebel of the Heart! 100. Kohza, Warrior of the Rebel Army! The Dream He Swore to Vivi! 109. The Key to a Reversal and Escape! Dle-dle Ball! 112. Rebel Army vs King's Army! The Final Showdown will be in Alubarna! 113. The pain of Alubarna! Captain 'Fierce Fighting' Karuh! 114. Protect the dream of friendship! Resolution at molehill 4th street! 115. Today's presentation: The Mane-Mane Montage! 121. Vivi's Voice Goes Unheard! A Hero Descends! 123. Smells Like Croc! Run to the Royal Family Tomb, Luffy! 126. I will surpass you! Rain falls in Arabasta! 128. Pirates' party and Alabasta escape strategy! 129. Everything Began That Day! Vivi Tells of Her Adventures! 130. Dangerous scent! The seventh person is Nico Robin! 132. Rebellion of a navigation officer! To the dream which is not! 135. Pirate hunting of rumor! 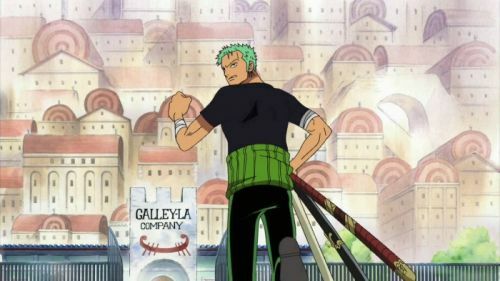 Wanderin Swordsman Zoro! 136. Zenii of the island of a goat, and the pirate ship in a mountain! 137. It profits and is the ambition of moneylender Zenii! 138. Whereabouts of the treasure of an island! Zenni pirate team sortie! 140. Resident of an eternal country! Pumpkin pirate team! 144. Taken Lock Post! Salvage king Mashira! 146. Don't see a dream! The town Mock town of a sneer! 148. The legendary Morbran family! "Liar Norland"
149. Gold is full! Drive off a south bird! 151. 100 million man! The world's highest power and a pirate Blackbeard! 155. Forbidden holy place! Judgment of the island in which God lives, and heavens! 157. Escape! Trial of God which began to move! 160. 10% of probability of survival! Orb usage's Satori! 163. Mysterious Wonder! Trial of string and trial of love!? 165. Golden home village JAYA of the sky! It can aim and is the company of God! 172. The trial of swamp! Chopper VS Gedatsu!! 174. The Capital in sight! The Grand ruins of Shandia! 177. True value of the Trial of Iron! White thorn desperate fight!! 178. Spouting Iron! Zoro VS Shinto priest OMU!! 179. The upper ruins which collapse and die! Quintet to a finale!! 180. Confrontation of ancient ruins! The purpose of God and Eneru!! 181. Ambition to the Fairy Vearth! Flying Ship Maxim!! 182. They crash at last! Pirate Luffy VS God Eneru!! 183. Maxim surfacing! Despair begins to move! 184. 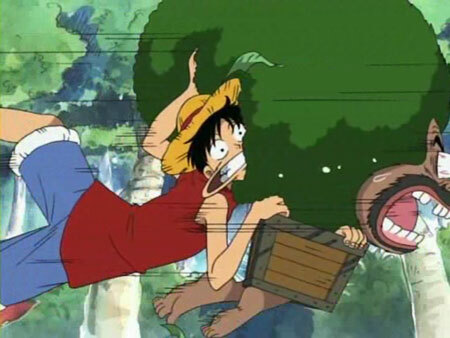 Luffy's fall! The judgment of God and Nami's wish!! 185. Two people who awake! Frontline Love Rescue which burns! 186. Towards the despair of Rhapsody, Capriccio! 188. Release from a spell! Tears which the large fighter shed!! 189. The eternal best friend! Bell of oath which echoes the mighty ocean!! 190. Angel island disappearance! Fear of Raigoh decending!! 194. I was Here! What the Ponegylph tells! 196. Mergency official announcement! Notorious pirate ship infiltration! 197. Sanji the Cook! The real value of the navy dining-room! 198. Zoro and Chopper's Urgent Operation! 199. The Search of the Approaching Marines! The Second Person Who Was Captured! 200. Luffy and Sanji's Desperate Decision! Large Rescue Maneuvers! 201. Hot blood special unit participation in the war! Bridge offensive and defensive battle! 202. Smash the Barricade! The Going Merry is Recovered! 204. The Gold Recovery Plan and the Waver Recovery Plan! 207. Big Adventure in Long Ring Long Land! 208. The Foxy Pirate Crew and the Davy Back! 211. Second Match! Shoot Into the Groggy Ring! 213. Round 3! The Roller Race Goes Round and Round! 214. The Climax of the Explosive Race! Burting into the Final Round! 215. The Screaming Speed-Serve! Pirate Dodgeball! 216. Final Match on the Edge! Red-Light! Green Light! 217. Captain Confrontation! The Last Fight: Combat! 219. Fierce Fighting Combat! The Decisive Ending! 220. You lost your memory? It was taken away? Who are you? 221. The Mysterious Boy with the Whistle and Robin's Guess! 223. Zoro Sharpens his Fangs! A fight with a Wild Animal! 224. The Real Memory Thief's Final Counterattack! 225. The man of incredible pride! Foxy the Silver Fox! 226. The unbeatable power draws near? A very dangerous man! 228. Rubber and Ice one-on-one fight! 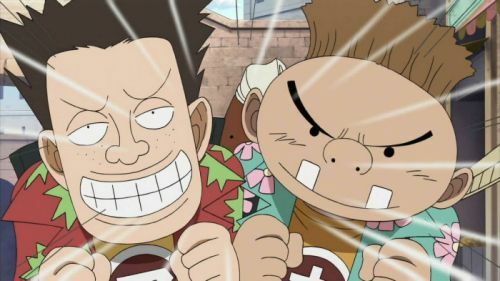 Luffy VS. Ao Kiji! 233. The Pirate Kidnapping Incident and Impending Death for the Ship! 234. Rescue our friend! Raid the Franky House! 235. The quarrel under the moon! The pirate flag which waves sadly! 247. The Man who loved the Boat! Usoop's Tears! 251. Truth of The Betrayal! Robin's Sad Decision! 254. The Shout of Nami's Soul! Straw Hat Luffy Revives! 256. Rescue Our Friends! Fists That Pledge the Bond Between Enemies! 258. A Man of Mystery Appears!? His Name is Sogeking! 262. Robin Struggles! SogeKing's Clever Scheme!! 263. The Judiciary Island! The Whole Picture of Enies Lobby! 264. Operation Disembarkation Commences! The Straw Hat Crew Rushes In! 265. Luffy Charges! Great Decisive Battle on the Judiciary Island! 266. Battle with the Giants! Open the Second Gate! 267. The Means of Escaping is Opened! Fly through the Sky, Rocketman! 269. Robin was Betrayed! The Expectations of the World Government! 270. Give Robin Back! Luffy VS Blueno! 271. Don't Stop! Raise the Signal Fire of a Counterattack! 273. All for the Sake of Protecting My Friends! Gear Second is in Motion! 274. Answer Us, Robin! The Shouts of the Straw Hat Crew!! 275. Robin's Past! The Girl Called a Devil! 276. A Mother and Child's Destiny! That Mother's Name is Olvia! 278. Say You Want to Live! We are Nakama!! 279. Jump Into the Falls! Luffy's Feelings!! 283. All for the Sake of a Nakama! Robin in Darkness! 287. Even if I die, I won't kick you! 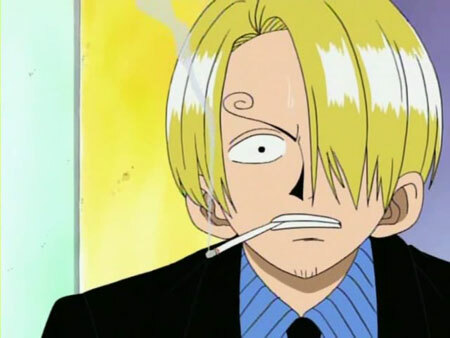 Sanji's Manly Soldier Way! 289. Zoro's New Technique Explodes! The Katana's Name is SogeKing? 294. Resounding Bad News! Invoke the Buster Call! 295. 5 Namis? Counterattack Together with a Mirage! 296. Nami's Decision! Shoot the Rampaging Chopper! 314. The Ultimate Lineage? Luffy's Father Revealed! 320. Everyone's Finally Wanted! The Crew of Over 6 Hundred Million! 321. Face the Sea, King of Beasts! The Dreamship's Grand Completion! 324. Circling Bounties! Hometowns Dance as the Ship Advances! 326. Mysterious Party of Pirates! The Sunny and a Dangerous Trap! 330. The Hard Fights of the Straw Hat Crew! The Pirate Soul Banking it All on the Flag! 340. The Man Called a Genius! Hogback Appears! 346. Dissapearing Strawhat Crew! The Mysterious Knight Appears! 348. Coming from the Sky! That Man is the "Humming" Swordsman!" 349. Luffy in an Emergency! The Destination of the Strongest Shadow! 351. Awakening After 500 Years!! Oz Revives!! 357. Sudden Death of the General Zombies!! 366. Defeat Absalom!! Nami's Lightning Attack of Friendship!! 367. One Down!! Sure Kill Straw Hat Docking? 371. The Straw Hat crew annihilated! Full-throttle Kage Kage abilities! 374. The Bodies Vanish! The Morning Sun Pierces Through the Nightmare Island! Если бы Вы могли стать главным героем аниме, кем бы Вы хотели стать? что за фраза "он съел фрукт дьявола и получил неограниченные полномочия"
Я немогу понять зачем СТОЛЬКО серий?